1,200 lb. Capacity C-Clamp. Single Spindle in Lower Jaw. 1,200 lb. Capacity C-clamp. Dual Spindle. 1,800 lb. Capacity C-Clamp. Single Spindle in Lower Jaw. 1,800 lb. Capacity C-Clamp. Dual Spindle. 400 lb. Capacity Adjustable C-Clamp. 300 lb. Capacity Adjustable C-Clamp. 1,800 lb. Capacity Adjustable C-Clamp. 800 lb. 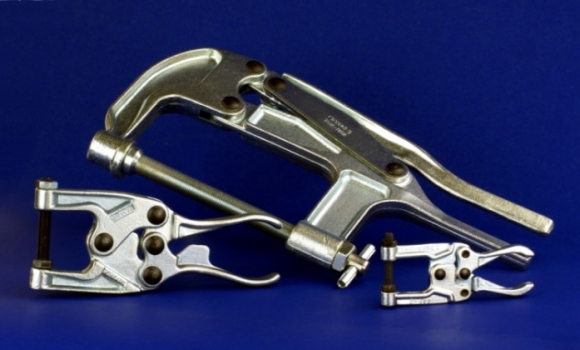 Capacity Plier Clamp with Spring Loaded Spindle. 1,200 lb. Capacity Plier with Hole-Locating Spindle Assembly. 400 lb. Capacity Plier with Hole-Locating Spindle Assembly. 800 lb. Capacity Dual Spindle Plier with Quick Release Lever. 800 lb. Capacity Drop-Jaw Plier with Quick Release Lever. 1200 lb. capacity Single Spindle Heavy-Duty Plier. 800 lb. Capacity Dual Spindle Plier. 800 lb. Capacity Drop-Jaw Plier.